Unlike most of C.B. Macdonald’s template holes which use design characteristics from other great Scottish holes, “the cape hole” is original to C.B. Macdonald. Macdonald’s first cape hole was the 14th at National Golf Links of America (NGLA), which originally played as a 305 yard dogleg right to a green that was surrounded by water on three sides. Fearing technology improvements would make the hole drivable, Macdonald later lengthened the hole, moving the green back and surrounding it with bunkering on three sides instead of water. 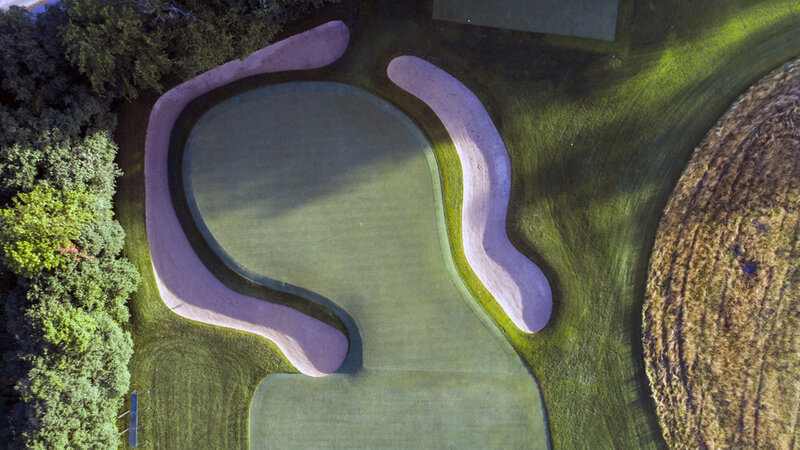 The word “cape” is defined as a “point of land extending into water.” This aligns with NGLA’s original 14th design as opposed to its current design which is a green surrounded by bunkers. 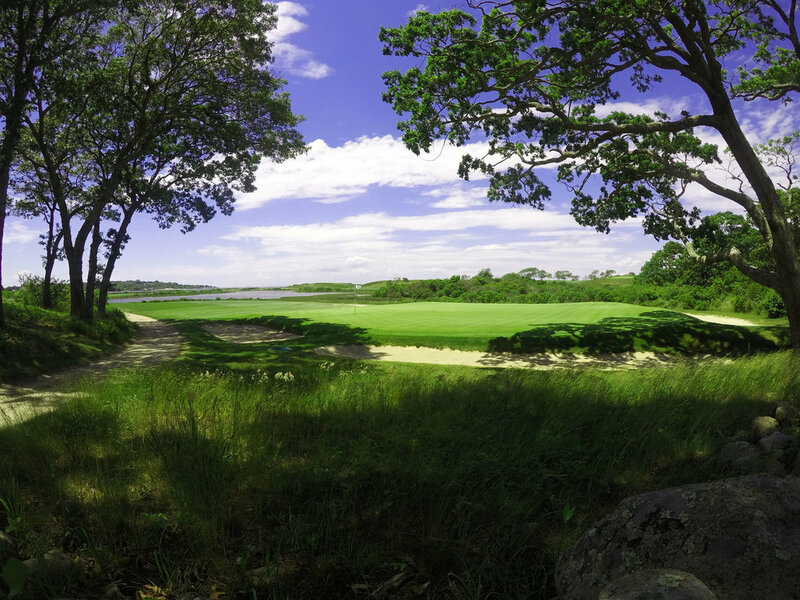 In today’s modern architectural world, a cape hole’s defining characteristics have become the diagonal tee shot over water and the bunkering around the green. This is different than Macdonald’s original intention of a second shot to a green jutting out into water. While the diagonal tee shot wasn’t an original concept, the approach to a green jutting into water was. Off the tee, a player is forced to drive over a diagonal water hazard and determine how much to bite off. Often times, Macdonald and Raynor would have the fairway kick toward the hazard making cutting off a large chunk a riskier proposition. On a player’s approach shot, he will be met with an intimidating shot to a well-protected and undulated green. A cape hole’s green is surrounded on three sides by water or bunkers. A cape green often looks as if it is floating over a water hazard. Cape holes are usually par 4’s and can range in length from the low 300’s to mid 400’s, a tough task at any length. Risk and reward is the theme of a cape hole. The ideal way to play the hole is by shaping a tee shot to limit the risk and shortening your second shot into the green. If the hole is moving to the left over the hazard, a right-to-left shot is the ideal tee shot. If the hole is moving to the right over the hazard, a left-to-right tee shot is ideal. On the approach to the green, a player must also decide whether or not to take the risk of attacking the pin and bringing the hazard (water or a bunker) into play. A safe shot is to play to the center of the green and try and make a long putt on a typically undulated green. The modified original 14th at NGLA has a tee shot that plays over the Sebonac Creek which runs along the right side of the hole up to the green. Depending on the tee position and player, the 14th can be a drivable hole. One of the toughest aspects of the 14th is the tee shot, the ground contours severely from left to right. Architect C.B. Macdonald was a chronic slicer of the golf ball which makes this design interesting. I would guess that Charlie lost quite a few golf balls in the creek right. The approach shot has a green that floats over the Sebonac Creek and has thin rim of bunkering. Bailing out to the right opens up the possibility of finding one of the nasty pot bunkers. Perhaps the most famous cape hole in the world is at C.B. Macdonald’s Mid Ocean Club in Bermuda. The fifth hole is an absolute brute that plays from right to left over Mangrove Lake. An ideal tee shot is a draw that helps cut off a lot of the yardage. If a player lays back or fails to turn their tee shot over, they will be left with a long approach shot to green with trouble surrounding. A tale of the fifth at Mid Ocean is that Babe Ruth played the course, attempting to drive the green over and over until he had put 20 golf balls into the Mangrove Lake. This illustration from the Mid Ocean Club’s website does a fantastic job of conveying the importance of the tee shot on a cape hole. This illustration of Mid Ocean's 5th gives you an idea of the risk that comes with cutting the corner. The short cape hole at Chicago Golf exemplifies the principles of the hole design. It's a waterless hole that has a long diagonal cross bunker that guards the aggressive line off the tee. The green is surrounded by sand and makes for difficult half wedge shots after an aggressive drive, particularly if they don't find the fairway. Chicago Golf's version of the Cape shows it's the second shot, not the tee shot that makes the hole a cape design. A beautiful short cape hole at Seth Raynor’s Chicago gem, the second is one of my favorite holes in golf. The water hazard here is a creek that cuts down the left side and eventually behind the green. The left side of the fairway has a sharp slope that can kick an over-aggressive shot into the creek. I typically play this hole by drawing a 3-iron off the left side of the right fairway bunker leaving a wedge shot to the challenging green. A great short cape hole, #2 at Shoreacres. The approach shot is a nervy one when the pin is on the left or back of the green which brings the creek into play. The green is large but undulated making long putts difficult to two putt. The second shot where the pin position and creek challenge the player's approach. Here’s a look at the creek that meanders down the left side and eventually behind the green, making an approach shot to the back pin nervy. A look from behind the 2nd green at Shoreacres, the creek playing a pivotal role. A true cape hole as the green juts out into the hazard leaving players with an intimidating approach shot to this gem of a short par 4. The 8th at Macdonald’s St. Louis C.C. is described by Kyle Traux as “the best hole on a great course.” The tee shot gives a player options, the green can be driven with a strong tee shot but trouble awaits long and right of the green. A safe layup shot will leave a wedge approach that players can't fall asleep on. An aerial view of St. Louis' par 4 8th. Up until 2 years ago, all the fescue that you saw down the right side was trees and after their removal the beautiful vista was restored. Another great short cape hole is at Oakmont’s neighbor, Seth Raynor’s Fox Chapel Golf Club. The fifth hole calls for a right to left shot off the tee. A player would be wise to challenge the water in order to not leave a long shot to a well guarded green. The tee shot at Fox Chapel's 5th hole. The 5th green has the marsh protecting the left side of this elevated green and deep bunkers everywhere else, requiring players to hit a good wedge or pay the price. Macdonald’s short cape hole at New York’s Creek Club is one of the most unique. Drivable by many, the thin fairway forces players to hit an excellent shot whether they are going for the green or laying up. On the right side is marshland and on the left sand dunes, neither a good place to miss your tee shot. If you find the fairway, the green is wide, receptive and relatively flat, but guarded by deep bunkers. Perhaps Seth Raynor’s best design is Fishers Island Club, dubbed “Pebble Beach of the East.” The cape hole is an absolute beauty that doglegs left around a large water hazard. A more aggressive tee shot up the left yields a shorter approach into the green. Playing safe and right off the tee will leave a long-iron approach into the heavily protected green site. Fishers Island 2nd shot forces players to play over the water to reach the green that is guarded by the hazard and bunkers, with only a small bailout area short and right. Seth Raynor’s gem in Cincinnati has no water hazards on the course, its cape hole thus plays around a tall grass hazard doglegging to the right. A tree marks the turn, forcing players to hit right or left of it to set up a clear approach to the green. The green is seemingly raised above the tall grasses, heavily bunkered, and any shot right will tumble down towards the thick stuff. Up until recently, the right side of the 8th was lined with trees. Thankfully, the removal process has begun, and this beauty has been opened up for everyone to see. The 8th at Midland Hills C.C., a Seth Raynor design, features a large lake that cuts along the right side that players need to navigate off the tee. Long hitters will need to really rip a tee shot to clear the water, which is a 270 yard carry from the back tee. I would love to see that maple tree removed to fully expose the fairway, but we all know tree removal can be a touchy subject at clubs :-). The 6th at Sweeten’s Cove is a beautiful modern day cape hole. A good tee shot that moves from right to left will leave a significantly shorter approach to this well protected green. Sweetens Cove features a true cape green, as the approach is flanked by bunkers on the right and back of the green, and the green juts out into the lake hazard that runs the entirety of the hole. A true cape green as Sweetens Cove's 6th juts out into the water. The Brian Silva design in Chattanooga features this short cape hole on its finishing stretch. A birdie opportunity with a good tee shot, but a wayward one can lead to a big number quick. Here, the marsh runs along the entire left side of the hole, and the bunker deters players from bailing out right. Have a question about cape holes or have a photo of one we missed? Shoot us a line here.